Interested in international boat shipping services to and from the United States? Interested in international boat shipping or trailer shipping from the United States? Look no further than K International Transport Co., Inc. ‘s first-class international shipping services. As one of the leading overseas shipping companies in the United States we not only handle overseas vehicle shipping but we also ship boats on trailer and boats on cradle. We ship: jet skis, yachts, sail boats, pontoon boats, deck boats, house boats, inflatable boats, high performance boats, fishing boats, cruiser boats, cuddy cabin boats, speed boats, jet boats, wave runners, personal watercraft, sea doo, power boats, motor boats, trailer shipping and more. We can provide door pick-up / inland transport of boats on trailer or cradle. 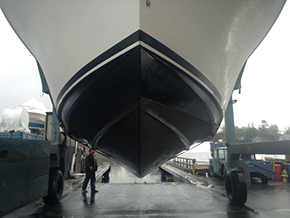 K International Transport Co., Inc. provides inland towing for boats on trailer and specialized step-deck and expandable trailers for boats on cradles. Oversized boats too large for the road can be delivered port-side in the USA through the utilization of all water delivery service. K International Transport Co., Inc. will ship your boat / watercraft on trailer by roll-on/roll-off vessels to available worldwide destinations. Boats on cradle are shipped on a mafi roll trailer or flatrack. Customized cradles properly suited for the overseas transport of your boat / watercraft can also be built. A custom-built cradles was made for this boat delivered alongside the shipping vessel. The boat was safely secured to the cradle and shipped to Italy. Boats on trailer are simply towed onto a roll-on/roll-off vessel. Easiest and most economical way to ship your boat! Boats on cradle are loaded on mafi roll trailers or flat racks. Large boats can be delivered port-side, lifted out of the water and secured onto the shipping vessel. 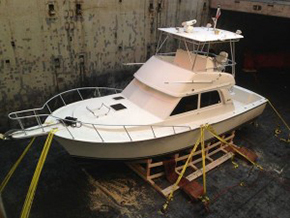 Looking to ship your smaller, light-weight boat? 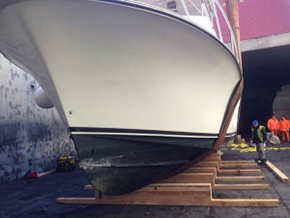 K International can also ship smaller boats under 44,000 lbs in a container. Hundreds of individuals have found the reliability and service they expect by shipping their used and new boat / watercrafts worldwide with K International Transport.